For 17 days straight, the Tijuana River Valley was being flooded with more than 143 million gallons of sewage seeping in from a rupture in a sewage collector pipe on the Mexico side of the border. This is by far the largest sewage spill in over a decade, if not ever. The stench of raw sewage was consistently being reported with nothing but silence in response from authorities on both sides of the border. Their inaction has put the health of our communities at risk, with the spill polluting and closing beaches from Rosarito to Coronado. Our NO Border Sewage Committee has been working for years to address and eliminate the sewage, trash, sediment and chemical waste that plagues our ocean, waves and beaches in the border region. We do this by raising awareness through outreach and education, while impacting policy through advocacy work. We are working with our partners on both sides of the border to hold those responsible accountable and we will continue to advocate for new sewage infrastructure in Tijuana, but we need your help in addressing this serious issue. I am writing to express my outrage regarding the 143 million gallons of raw sewage that was discharged into the Tijuana River upstream in Tijuana from February 6 to 23, 2017, and to ask for your support in resolving this critical environmental and public health issue. While the Tijuana River is notorious for trash and sewage, this is by far the largest raw sewage spill into the Tijuana River in over a decade. The enormity of the spill polluted beaches from Rosarito, MX to Coronado, CA and poses an unacceptable risk to humans, wildlife and the environment. On February 24th, 2017, the International Boundary and Water Commission (IBWC) in San Diego published a National Pollutant Dishcarge Elimination System (NPDES) federal sewage spill report that confirmed the discharge of 143 million gallons of raw sewage. However, prior to the report, residents of Imperial Beach and Tijuana noticed the familiar sewage stench and made multiple queries to the IBWC and authorities in Baja Norte, MX, asking what was going on. Despite the overwhelming evidence that a major sewage spill was occurring, these queries were met with deafening silence on both sides of the border. Launch a federal investigation into why this sewage spill was ignored and why it took more than 3 weeks for U.S. citizens to learn of the spill. Support the North American Development Bank Plan to improve Tijuana Sewage Infrastructure. 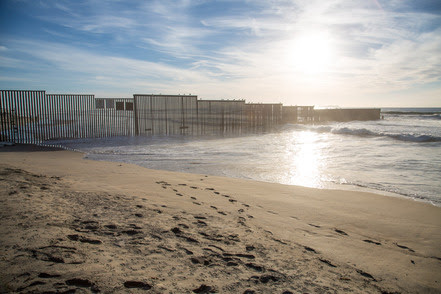 Allocate federal resources to address and eliminate the sewage, trash, sediment, and chemical waste that plagues our ocean, waves and beaches in the border region. Enforce the IBWC Minute 283 which stipulates against discharges of sewage into the Tijuana River Valley.